Strixton today is a tiny hamlet of farms and cottages. In 1901 there were 66 inhabitants. A little way from Wollaston on the rise of a hill, hugging the sides of a lonely road  a cul de sac  where few strange feet ever wander, and overlooking the verdant slopes of meadowland that drop to running water, is the quiet and sequestered village of Strixton. A charming little spot everyone would admit, but hardly any visitor would ever guess the wealth of historical association attached to it. In its day Strixton has been a place of some importance and there can be no doubt its population at one time was considerably larger than at present. The quaint little church is the only remaining monument of the village existing in those early days, and its monumental value is lessened by the re-building of the church in 1874, when all but the west end was taken down and reconstructed. By some it is believed to have been built originally about the same period in which the church at Earls Barton, famed for its Saxon tower, was erected. This, however, is subject to doubt, as the style is that of Early English, ecclesiastic architects declaring it to be a late specimen. The church has no tower, but there is a stone bell-cot over the western gable. This gives it a rather unusual appearance and the somewhat unique style of this western wall has probably led some to regard the building as being of an earlier type than the case. 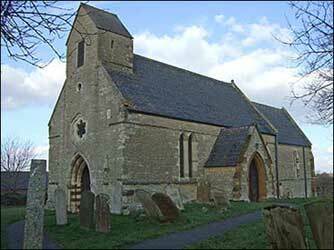 It is dedicated to St. John the Baptist, and is of stone, consisting of a chancel, nave, and south porch. Enclosed in the thickness of the western wall is a staircase leading to the bell-cot and the bell rope, passing through a hollow in the fabric, hangs down into the nave, where the ringer stands. 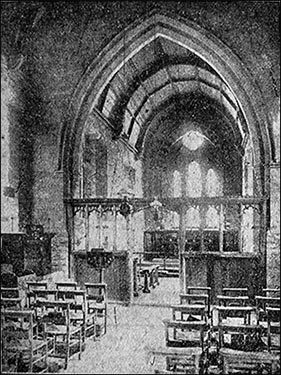 In the chancel there is a double piscine and close-by a small square-headed low side window. There is also a Perpendicular screen. It is interesting to note to work of 1874 of re-building the church stone by stone on exactly the same plan as the original, at a cost of £2,000, the work being necessitated by the decay of some of the fabric. During the undertaking a tomb containing the skeleton, presumably of a priest, with the usual sacramental vessels, was discovered in the south wall of the chancel. The register of the church dates only from the year 1729. Earlier registers, together with those of Bozeat, with which the living at Strixton is consolidated, were destroyed by fire in September of 1729. The living is in the gift of Lord Spencer, who, as is well known, is the lord of the manor and sole landowner. That the population of Strixton considerably exceeded its present census of about sixty in earlier centuries is alone established by an old map, of which, Mr. W. S. Gibbard is the fortunate possessor. The map was prepared in the sixteenth century, and Strixton then had a street, well liked with houses, and next to the church was a large residence. The site of the residence is still to be seen in the meadow that lies between the church and the high road. Ridges show where the foundations existed, and the lower flat portion in the centre was evidently the courtyard. There remain also, traces of a roadway leading from where the house stood to the Wollaston-Bozeat road. Around the field is a wall which, extending as far as it does, is a very noticeable feature from the highway. This stout boundary fence is of no great age, and some of the inhabitants of the place have a clear recollection of its erection, or rather its re-erection, for there was, of course, a similar fence many generations previously. Whilst engaged in the work of pulling down the old construction the men came across an old coffin of diminutive proportions, and on being opened it was found to contain the skeleton of a dog. It is a reasonable assumption that they were the remains of an old favourite at the mansion, which has been referred to, and only stood a short distance from that very spot. “Here are only two families. The lordship is enclosed. Before the inclosure there appears to have been more houses. The manor house hath an orchard of near eight acres, well planted with different kinds of fruits. In similar wording the exchange of owners is told, until we come to the 17th century, when it was owned by Sir Edward Alston, of East Barnet, and later became the property of Hester and Elizabeth Wiseman, who at the time of the writing of the history were in possession. The terms “hide” and “virgate” were old measurements for land of a somewhat elastic character. A hide is described as being as much land as could be tilled with one plough, and a virgate (or yardland) as a quantity of land differing in various counties and varying from 15 to 40 acres. Strixton has a share of legend and tradition. If you take the trouble to look round the meadow between the church and road you will find a pond  quite an ordinary-looking piece of water  and this is said to have been a bath. Some have gone so far as to suggest it was a Roman bath, whilst others are satisfied with the supposition that it was a private bath for the mansion which stood near by. In support of the conjecture there was the discovery of a smooth-bricked bottom to the pond when it was cleared out some years ago. The tradition has it that the coaches used to stop for watering at the strip of water below the farm house now occupied by Mr. W. O. Sanders, and that on one occasion coach and horses were drowned there. Beyond signs of a roadway from the path to the road there is nothing to corroborate it. 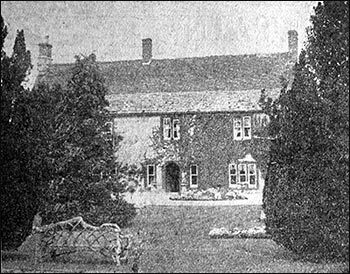 Our pictures show interior and exterior of the quaint old church and the charming residence at the further end of the village, occupied by Mr. W. S. Gibbard, one of the rural councillors for Wollaston and Strixton.